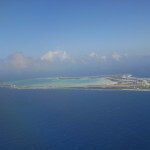 Wake Island is variously described as V-shaped, horseshoe-shaped, or wishbone-shaped. I like the last best, and so it seems appropriate to recall Thanksgiving on Wake Island in 1941. Thanksgiving fell on November 20, 1941, on Wake, other islands, D. C., and two-thirds of the states. For the third Depression year in a row, President Franklin Roosevelt had proclaimed Thanksgiving on the third Thursday of November instead of the traditional last Thursday of the month in order to extend consumer holiday spending in a tough economic climate. This year thirty-two states agreed; the others scoffed at “Franksgiving” and waited another week for their turkey. The civilian construction workers on Wake Island welcomed the early holiday, noting that by virtue of Wake’s location west of the international date line, they were the first Americans to sit down to Thanksgiving dinner. The day offered many options for relaxation and sport before the big feast was served in the mess hall. In a letter home, R. E. Forsythe noted that the main attraction was deep-sea fishing, with parties leaving at 7 AM and 2 PM, carried by tugboat to a large barge anchored offshore. Others went shell hunting along the shore, swam, played horseshoes or tennis, listened to records, and wrote letters home. Some squeezed in rehearsals for the upcoming stage show. A baseball game in the afternoon drew many spectators. Joe McDonald typed a letter to his folks on November 20, 1941, describing the “really excellent” dinner, considering that “most of it came out of cans and what didn’t had to be shipped in refers for several thousand miles.” Twelve hundred men sat down to “Turkey with all the fixin’s, Roast Beef, Vegetable salad with fresh tomatoes, fruit cup, shrimp salad, celery, olives and other appetizers, mince pie and ice cream for dessert and coffee.” Well rested and well fed, the men gathered in the outdoor theater for the evening’s picture show: The Hurricane. While the civilians whiled away the Thanksgiving holiday and filled their bellies with fine foods, the Wake Marine detachment worked through the day on their big gun emplacements at the three points on the atoll. Any visions of turkey with all the fixin’s were dashed when their mess served up Thanksgiving dinner of “ox tongue, rice, and hardtack.” Perhaps some of the marines found a way to trade their beer for a slice of civilian pie later that evening. In eighteen days life on the wishbone-shaped atoll would be turned upside-down and Thanksgiving, for all it was and wasn’t on November 20, 1941, would recede in memory like a dream.